This short series of videos follows the artist Michael Takeo Magruder as he conceived, developed and finally presented his installation for Stations of the Cross at St. Stephen, Walbrook in London in 2016. Michael completed a new version of this piece for Station Nine at Church of the Epiphany in Washington, DC. Arriving at Station XIII - 1. Context from Emma Puente on Vimeo. Arriving at Station XIII - 2. Research from Emma Puente on Vimeo. Arriving at Station XIII - 3. Production from Emma Puente on Vimeo. Ndume Olatushani is an artist, organizer, and a passionate advocate for justice. The American incarceration system will imprison 1 in 3 Black males during their lifetime, and it has become Ndume’s mission to change the course for thousands of children and people of color. 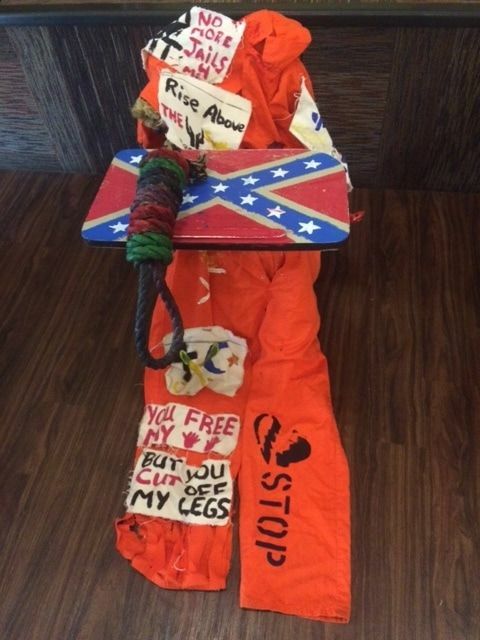 His Stations installation “Disturbing the Cradle to Prison Pipeline,” is a reflection of this continued fight. The passion reflected in his art comes from a place of experience. Ndume was imprisoned for 28 years, 20 of those years on death row, for a crime that he did not commit. He became a self-taught fine artist while in prison and is now using his gift to give back to the community. Ndume travels the world invoking deep thought and influencing thousands by displaying his art, and fights to change justice policies as a member of the Children’s Defense Fund organizing team. “I feel strongly about not forgetting all the men I left behind in prison. I am deeply committed to working for criminal justice reform. The work [I and my coworkers are] doing to challenge policies resulting in the mass incarceration of people of color and especially the zero tolerance policies leading to the criminalization of our children is incredibly important to me and it should be to all of us. I witnessed what the policies of mass incarceration have done to generations and we don’t have to wonder about its effects on our future,” Ndume Olatushani, as told to Huffington Post. ​This video shows Leni Dothan's work never_never for Stations 2016 in London, in which she created a piece inspired by the Pieta for Temple Church. She built upon this work for Stations DC in 2017 with new works examining other aspects of Christian iconography. Her works can be seen at Station Eight, located in the First Congregational United Church of Christ. Washington City Paper, March 2; The Huffington Post, March 21; Street Sense, March 23; The Informed Humane Blog March 25; The Washington Post April 16, 2017.